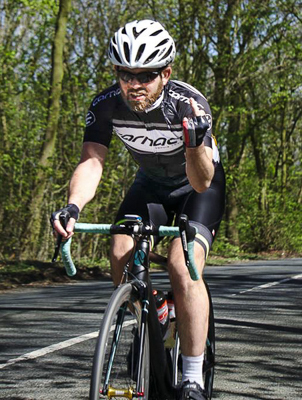 Race Report: Two-Club, Two-Day road race. With selective amnesia already kicking in to protect my fragile psyche from the horrors of the last two days, all I can really report is dim recollections of going uphill far faster and for far longer than I physically can, before going downhill far faster than I thought I could, before going uphill far faster and for far longer than I physically can, before doing it all over again the next day. Saturday was the Old Hutton circuit, Sunday the Aughton circuit. On Saturday I got dropped by the bunch with a few other riders as the pace up the big hill at the end of the lap was too stiff; we reeled in the bunch only to be mercilessly dropped on the hill once again. We tagged on to the back of some big boys trying to get back in the race after some punctures; two laps of that and I was dropped again. Owch. Stubbornly undeterred I staggered round and, in Mark Cavendish style, finished 1 minute inside the cut-off on a course which, shall we say, doesn't exactly play to my strengths. Sunday was more of the same, except this time I got gapped on lap 2 because I was stuck behind a couple of nervous descenders (weird, that's normally me), and we were unable to reel in the bunch on the following long drag. So another four laps of hacking along in a small group followed before (a pattern emerges) I got dropped again and staggered around the last two laps on my own. Again, in the style of Mark Cavendish, I tottered over the line about 1 minute before the cut-off. At least after all that suffering my reward was finishing the full race distance on both days, which is progress, and it was a bloody strong field for a 3/4 race (the Pimbo race two weeks ago didn't compare at all). And the cakes and coffee on day 2 were excellent - it was a really well-organised event and everyone seemed to have a great time on a rare 2-stager. Same time same place next year, I suppose? Oh yeah, and this time Stephen Wattam got a crystal-clear pic of me on day 2.